In There is more to say about MPEG standards I presented the entire spectrum of MPEG standards. No one should deny that it is an impressive set of disparate technologies integrated to cover fields connected by the common thread of Data Compression: Coding of Video, Audio, 3D Graphics, Fonts, Digital Items, Sensors and Actuators Data, Genome, and Neural Networks; Media Description and Composition; Systems support; Intellectual Property Management and Protection (IPMP); Transport; Application Formats; API; and Media Systems. How on earth can all these technologies be specified and integrated in MPEG standards to respond to industry needs? This article will try and answer this question. It will do so by starting, as many novels do, from the end (of an MPEG meeting). In the method of work, i.e. an AhG operates under the leadership of one or more Chairs. Clearly, though, the success of an AhG depends very much on the attitude and activity of its members. On average some 25 AhGs are established at each meeting. There is not one-to-one correspondence between MPEG activities and AhGs. Actually AhGs are great opportunities to explore new and possibly cross-subgroup ideas. 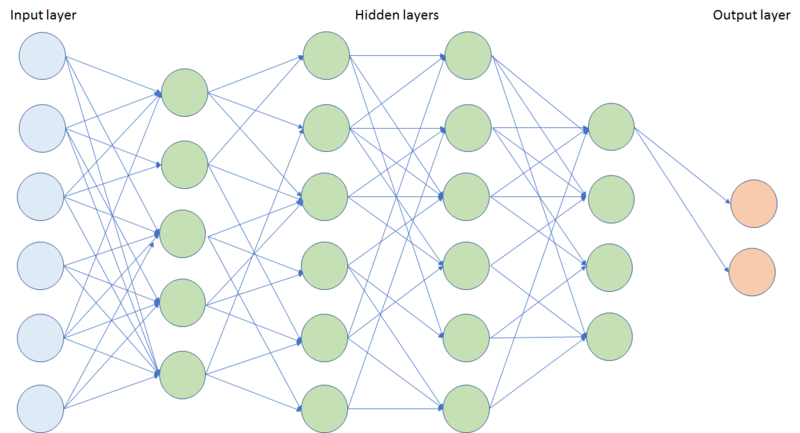 Compression of Neural Networks (NNR). An AhG uses different means to carry out collaborative work: by using reflectors, by teleconferencing and by holding physical meetings. The last can only be held if they were scheduled in the AhG establishment form. Unscheduled physical meetings may only be held if there is unanimous agreement of those who subscribed to the AhG. Most AhGs hold scheduled meetings on the weekend that precedes the next MPEG meeting. These are very useful to coordinate the results of the work done and to prepare the report that all AhGs must make to the MPEG plenary on the following Monday. AhG meetings, including those in the weekend preceding the MPEG meeting, are not formally part of an MPEG meeting. On Thursday evening to wrap up the expected results and review the preliminary results of the week. On Friday afternoon to approve the results of the work of Subgroups, including liaison letters, to establish new AhGs etc. Subgroups start their meetings on Monday afternoon. They review their own activities and kick off work in their areas. Each subgroup assigns activities to breakout groups (BoG) who meet with their own schedules to achieve the goals assigned. Each Subgroup may hold other brief meetings to keep everybody in the Subgroup in sync with the general progress of the work. For instance, the activities of the Systems Subgroups are currently: File format, DASH, OMAF, OMAF and DASH, OMAF and MIAF, MPEG Media Transport, Network Based Media Processing and PCC Systems. The MPEG structure is designed to facilitate interactions between different Subgroups and BoGs from different Subgroups to discuss matters that affect different Subgroups and BoGs, because they are at the interface of MPEG subsystems, For example, the table below lists the joint meetings that the Systems Subgroup held with other Subgroups at the January 2019 meeting. NB: VCEG is the Video Coding Experts Group of ITU-T Study Group 16. It is not an MPEG Subgroup. On Friday morning all Subgroups approve their own results. These are automatically integrated in the general document to be approved by the MPEG Plenary on Friday afternoon. On Monday evening, an informal group of experts from different countries examines issues of general (non-technical) interest. In particular it calls for meeting hosts, reviews proposals of meeting hosts, makes recommendations of meeting hosts to the plenary etc. Figure 1 depicts the workflow described in the paragraphs above, starting from the end of the N-1 th meeting to the end of the N-th meeting. What is “done” at an MPEG meeting? There are around 500 of the best worldwide experts attending an MPEG meeting. It is an incredible amount of brain power that is mobilised at an MPEG meeting. In the following I will try and explain how this brain power is directed. Let’s take as example the work done in the Video Coding area at the March 2019 meeting. The types of documents resulting from the activities (see the following legend for an explanation of the acronyms). Figure 2 does not provide a quantitative measure of “how many” documents were produced for each activity or “how big” they were. As an example, Point Cloud Compression has 20 Core Experiments and 8 Exploration Experiments under way, while MPEG-5 EVC has only one large CE. An average value of activity at the March 2019 meeting is provided by dividing the number of output documents (212), by the number of activities (97), i.e. 2.2. MPEG holds quarterly meetings with an attendance of ~500 experts. If we assume that the average salary of an MPEG expert is 500 $/working day and that every expert stays 6 days (to account for attendance at AhG meetings), the industry investment in attending MPEG meetings is 1.5 M$/meeting or 6 M$/year. Of course, the total investment is more than that and probably in excess of 1B$ a year. With the meeting organisation described above MPEG tries to get the most out of the industry investment in MPEG standards. The article MPEG: what it did, is doing, will do recounts my statistically not insignificant experience of asking taxi drivers across different cities of the world if they know MPEG. I do not have similar amount of data to report for ISO, but I am pretty sure that if I asked a taxi driver if they know ISO, the yes rate would be considerably lower than for MPEG. This is not merit of MPEG or demerit of ISO as organisations. MPEG – Moving Pictures Experts Group – is lucky to deal with things that let people make content that other people can see and hear in ever new ways. ISO – International Organisation for Standardisation – is an organisation with the mission to develop international standards for anything that is not telecommunication – the purview of the International Telecommunication Union (ITU) – and electrotechnical – the purview of the International Electrotechnical Commission (IEC). The above may seem rather abstract, so let’s see what the difference means in practice. 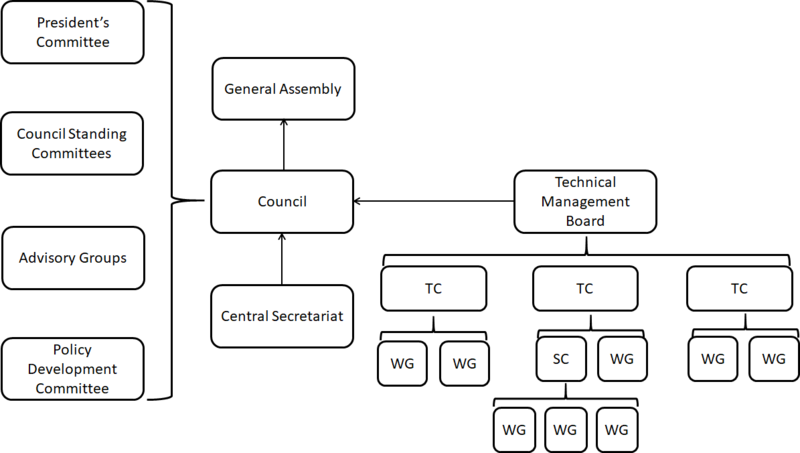 ISO is a huge organisation structured in Technical Committees (TC). Actually, the structure is more complex than that (see Figure 1), but for the purpose of what I want to say, this is enough. The first 3 – still active – TCs in ISO are: TC 1 Screw threads, TC 2 Fasteners and TC 4 Rolling bearings. The standards produced by these TCs are industrially very important, but the topics hardly make peoples’ hearts beat faster. The last 3 TCs in order of establishment are TC 322 Sustainable finance, TC 323 Circular economy and TC 324 Sharing economy. The standards produced by these TCs are important for the financial industries, but probably little known even in financial circles. Between these two extremes we have a large number of TCs, e.g., TC 35 Paints and varnishes, TC 186 Cutlery and table and decorative metal hollow-ware, TC 249 Traditional Chinese medicine, TC 282 Water reuse, TC 297 Waste collection and transportation management, etc. ISO TCs work on areas of human endeavour that are extremely important to industrial and social life. Many of these activities, however, do not say much to man in the street. In 1987 ISO/TC 97 Data Processing merged with IEC/TC 83 Information technology equipment. The resulting (joint) technical committee was and is called ISO/IEC JTC 1 Information Technology. One JTC 1 SC, SC 2 Character sets and Information Coding of JTC 1, included WG 8 Coding of Audio and Picture Information. WG 8 established the Moving Picture Experts Group (MPEG) in January 1988. In 1991 when SC 2/WG 8 seceded from SC 2 and became SC 29, MPEG became WG 11 Coding of audio, picture, multimedia and hypermedia information (but everybody calls it MPEG). Those who have survived the description of the ISO organigram will now have the opportunity to understand how this group of experts, in the depths of the ISO (and IEC) organisation changed the world of media and impacted the lives of billions of people, probably all of those on the face of the Earth, if we exclude some hermits in the few surviving tropical forests, the many deserts or the frozen lands. The main reason of the success of MPEG is that for 30 years it had carte blanche to implement its ideas. Some of them were clear at the outset, others took shape from a process of learning on the job. Let’s revisit MPEG’s ideas of standardisation to understand what it did and why. The first idea relates to the scope of MPEG standards. In the analogue world absence or scarce availability of broadband communication or deliberate policies or the natural separation between industries that traditionally had little in common, favoured the definition of country-based or industry-based standards. The first steps toward digital video undertaken by countries and industries trod similar paths: different countries and industries tried their own way independently. MPEG jumped in the scene at a time the different trials had not had the time to solidify, and the epochal analogue-to-digital transition gave MPEG a unique opportunity to effect its disruptive action. MPEG knew that it was technically possible to develop generic standards that could be used in all countries of the world and in all industries that needed compressed digital media. MPEG saw that all actors affected – manufacturers, service providers and end users – would gain if such a bold action was taken. When MPEG began to tread its adventurous path, MPEG did not know whether it was procedurally possible to achieve that goal. But it gambled and gave it a try. It used the Requirements subgroup to develop generic requirements, acted on the major countries and trade/standards associations of the main industries and magically got their agreement. The network of liaisons and, sometimes, joint activities is the asset that allowed MPEG to implement idea #1 and helped achieve many of the subsequent goals. Standards are ethereal entities, but their impact is very concrete. This was true and well understood in the world of analogue media. At that time a company that had developed a successful product would try to get a “standard” stamp on it, share the technology with its competitors and enjoy the economic benefits of their “standard” technology. With its second idea MPEG reshuffled the existing order of steps. Instead of waiting for the market to decide which technology would win – an outcome that very often had little to do with the value of the technology – MPEG offered its standard development process where the collaboratively defined “best” is developed and assessed by MPEG experts who decide which individual technology wins. Then the “standard” technology package developed by MPEG is taken over by the market. MPEG standards are consistently the best standards at a given time. Those who have technologies selected to be part of MPEG standards reap the benefits and most likely will continue investing in new technologies for future standards. The third idea is a consequence of the first two. MPEG-1 was driven by the expected possibilities of the audio and video compression technologies of the time. It was a bet on silicon making it possible to execute the complex operations implied by the standard so that industry could build products of which there was no evidence but only educated guesses: interactive video on CD and digital audio broadcasting. Ironically, neither really took off, but other products that relied on the MPEG-1 technologies – Video CD and MP3 – were (the former) and still are (the latter) extremely successful. MPEG standards anticipate market needs. They are regularly bets that a certain standard technology will be adopted. In More standards – more successes – more failures you can see how some MPEG standards are extremely successful and other less so. The fourth idea was simple and disruptive. Since its first instances in the 1920s, industry and governments have created tens of television formats, mostly around the basic NTSC, PAL and SECAM families. Even in the late 1960’s, when the Picturephone was developed, AT&T invented a new 267-line format, with no obvious connection with any of the existing video formats. How different formats are handled is outside of MPEG standards. The fifth idea was kind of obvious but no less disruptive. Because of the way audio and video industries had developed – audio for a century and video for half a century – people working on the corresponding technologies tended to operate in “watertight compartments”, be they in academia, research or companies. That attitude had some justification in the analogue world because the relevant technologies were indeed different and there was not so much added value in keeping the technologies together, considering the big effort needed to keep the experts together. However, the digital world with its commonality of technologies, no longer justified keeping the two domains separate. That is why MPEG, just 6 months after its first meeting, kicked off the Audio subgroup after successfully assembling in a few months the best experts. This injection of new technology with the experts that carried it was not effortless. When transformed into digital, audio and video signals are bits and bits and bits, but the sources are different and influence how they are compressed. Audio experts shared some (at a high level) compression technologies – Subband and Discrete Cosine Transform – but video is (was) a 2D signal changing in time often with “objects” in it, while audio is (was) a 1D signal. More importantly, audio experts were driven by other concerns such as the way the human hearing process handles the data coming out of the frequency analysis carried out by the human cochlea. The audio work was never “dependent” on the video work. MPEG audio standards can have a stand-alone use (i.e. they do not assume that there is a video associated with it), but there is no MPEG video standard that is without an MPEG Audio standard. So it was necessary to keep the two together and it is even more important to do so now when both video and audio are both 3D signals changing in time. This may look cryptic but it states the obvious. Having audio and video together does not necessarily mean that audio and video will play together in the right way if they are stored on a disk or transmitted over a channel. The fact that MPEG established a Digital Storage Media subgroup and a Systems subgroups 18 months after its foundation signals that MPEG has always been keenly aware of the issue that a bitstream composed by MPEG audio and video bitstreams need to be transported to be played back as intended by the bitstream creator. In MPEG-1 it was a bitstream in a controlled environment, in MPEG-2 it was a bitstream in a noisy environment, from MPEG-4 on it was on IP, in MPEG-DASH it had to deal with unpredictability of the Internet Protocol in the real world. During its existence the issue of multiplexing and transport formats have shaped MPEG standards. Without a Systems subgroup, efficiently compressed audio and video bitstreams would have remained floating in the space without a standard means to plug them into real systems. Most MPEG standards are composed of the 3 key elements – audio, video and systems – that make an audio-visual system and some, such as MPEG-4 and MPEG-I, even include 3D Graphic information. These standards are integrated in the sense that, if you need a complete solution, you can get what you need from the package offered by MPEG. The world is more complicated than that. Some users want to cherry pick technologies. In the case of MPEG-I, most likely MPEG will not standardise a Scene Description technology but will just indicate how externally defined technologies can be plugged into the syste. With its seventh idea MPEG is ready to satisfy the needs of all customers. It defines the means to signal how an external technology can be plugged into a set of other native MPEG technologies. With one caveat: customer has to take care of the integration of the external technology. That MPEG will not do. To describe the eight idea, I will seek help from the Greek philosopher Heraclitus (or whoever was the person who said it): τὰ πάντα ῥεῖ καὶ οὐδὲν μένει (everything flows and nothing stays). Digital technologies move fast and actually accelerate. By applying idea #3, #4, #5, #6 and #7, MPEG standards accelerated the orderly transition of analogue to digital media. By applying ideas #1 and #2, MPEG standards prompted technology convergence with its merging of industry segments and appearance of new players. The seventh idea reminds MPEG that the technology landscape is constantly changing and this awareness must inform its standards. Until HEVC – one can even say, including the upcoming Versatile Video Coding (VVC) – video meant coding a 2D rectangular area (in MPEG-4, a flat area of any shape). The birth of immersive visual experiences is not without pain, but they are becoming possible and MPEG must be ready with solutions that take this basic assumption into account. This means that, in the technology scenario that is shaping up, the MPEG role of “anticipatory standards” is ever more important and ever more challenging to achieve. The ninth idea goes down to the very nature of compression. What is the meaning of compression? Is it “less bits is always good” or can it also be “as few meaningful bits as possible is also good”? The former is certainly desirable but, as the nature of information consumption changes and compression digs deeper in the nature of information, compressed representations that offer easier access to the information embedded in the data becomes more valuable. What is the scope of application of MPEG compression? When MPEG started the MPEG-1 standards work, the gap that separated the telecom from the CE industries (the first two industries in attendance at that time) were as wide as the media industry and, say, the genomic industries today. Both are digital now and the dialogue gets easier. With patience and determination MPEG has succeeded in creating a common language and mind set in the media industries. This is an important foundation of MPEG standards, The same amalgamation will continue between MPEG and other industries. Figure 2 intends to attach some concreteness to the nine ideas illustrated above by showing some of the most successful MPEG standards issued from 31 years of MPEG activity. An entity at the lowest layer of the ISO hierarchy has masterminded the transition of media from the analogue to the digital world. Its standards underpin the evolution of digital media, foster the creation of new industries and offer unrelenting growth to old and new industries worth in excess of 1 trillion USD per year. Many thanks to the parent body SC 29 for managing the balloting of MPEG standards. There have always been people in need of technology and, most of the time, people ready to provide something in response to the demand. In book XVIII of Iliad, Thetis, Achilles’s mother, asks Hephestus, the god of, blacksmiths, craftsmen, artisans, sculptors and more, to provide a new armour to her son who had lost it to Hector. Hephestus duly complied. Still in the fictional domain, but in more recent years, Agent 007 visits Q Branch to get the latest gadgets for his next spy mission, which are inevitably put to good use in the mission. Wars have always been times when the need for technologies stretches the ability to supply them. In our, supposedly peaceful, age, there are lots of technology around, but it is often difficult for companies needing a particular technology to find the solution matching their needs and budget. Standardisation is an interesting case of an entity, typically non-commercial and non-governmental, needing technologies to make a standard. Often standards organisations, too, need technologies to accomplish their mission. How can they access the needed technologies? A few decades back, if industry needed a standard for, say, a video cassette recorder, the process was definitely supply-driven: a company who had developed a successful product (call it Sony or JVC) submitted a proposal (call it Betamax or VHS) to a standards committee (call it IEC SC 60B). Too bad if the process produced two standards. In the second half of the 1980’s, ITU SG XV (ITU numbering of that time) started developing the H.261 recommendation. Experts developed the standard piece by piece in the committee (so-called Okubo group) by acquiring the necessary technologies in a process where the roles of demand and supply were rather blurred. Only participants were entitled to provide their technologies to fulfill the needs of the standard. A handful of years later, MPEG further innovated technology procurement in a standardisation environment. To get the technologies needed to make a standard, it used a demand-driven tool – MPEG’s Call for Proposals (CfP). 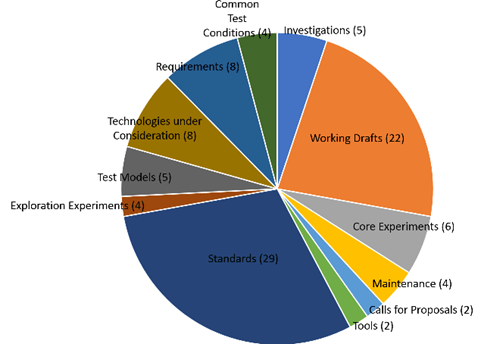 Since then, technologies provided by respondents and assessed for relevance by the group are used to 1) create the initial reference model (RM0) and 2) initiate a first round of Core Experiments (CE). CEs result from the agreement among participating experts that there is room for improving the performance of the standard under development by opening a particular area to optimisation. CEs are continued until available room for optimisation is exhausted. While anybody is entitled to respond to a CfP and contribute technology to RM0, only experts participating in the standardisation project can provide technology for CEs. This, however, is not really a limitation because the process is open to anybody wishing to join a recognised standards organisation who is a member of ISO. The MPEG process of standards development has allowed the industry to maintain a sustained development and expansion for many years. In fairness, this is not entirely MPEG’s merit. Patent pools have played a synergistic role to MPEG’s by providing (industry) users with the means to practice MPEG standards and IP holders the means to be remunerated for the use of their IP. The HEVC case has shown that the cooperation of different parties to achieve the common goal of enabling the use of a standard is not discounted (see, e.g., A crisis, the causes and a solution). There are several reasons for this: the increasing number of individual technologies needed to make a high-performance MPEG standard, the increasing number of IP holders, the increasing number of Non-Performing Entities (NPE) as providers of technology and the increasing number of patent pools who stand as independent licence providers of a portion of a patent. 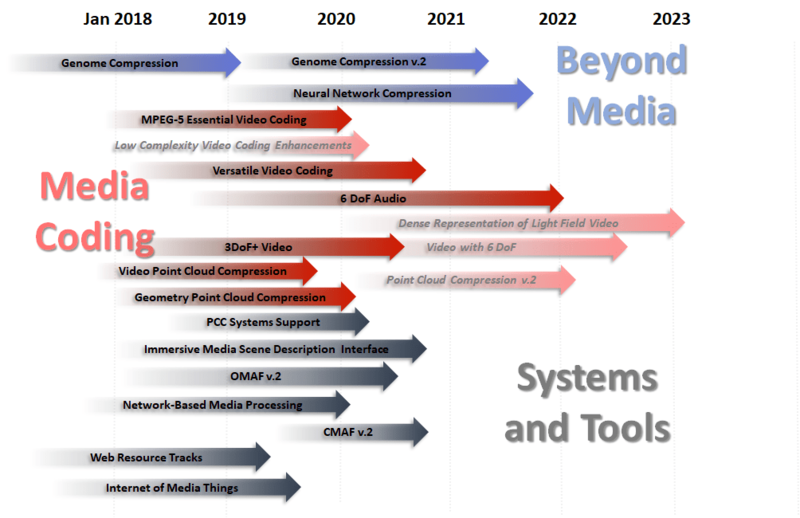 I have already made several proposals with the intention of helping MPEG from this stalemate (see, e.g., Business model based ISO/IEC standards). Here I would like to present an additional idea that extends the MPEG process of standards development (see How does MPEG actually work?). If room for RM optimisation is exhausted but there are still tokens unassigned, token holders have their tokens scaled up so that the total number of tokens is 1,000. In case the entity developing the specification is a standards organisation, more than one patent pool can develop a licence using the results of the process. This idea was developed in collaboration with Malvika Rao, the founder of Incentives Research and holder of a PhD from Harvard University, and Don Marti, an open source expert and an advisor at Incentives Research. Converting the basic concept described above into a workable market design requires further work. There may be opportunities to game the system, and the design must consider issues such as how to attract and retain participation. In addition the design must be tested (e.g., via simulation or usability study) to understand its performance. Please send comments to Leonardo. The most visited articles on this blog Forty years of video coding and counting and Thirty years of audio coding and counting prove that MPEG is known for its audio and video coding standards. But I will not tire of saying that MPEG would not it be what it has become if the Systems aspects had not been part of most of its standards. This is what I intend to talk about in this article. It is hard to acknowledge, but MPEG was not the first to deal with the problem of putting together digital audio and video for delivery purposes. In the second half of the 1990’s ITU-T dealt with the problem of handling audio-visual services using the basic ISDN access at 2B+D (2×64 kbit/s) or the primary ISDN access, the first digital streams made possible by ITU-T Recommendations. Figure 1 depicts the solution specified in ITU Recommendation H.221. Let’s assume that we have 2 B channels at 64 kbit/s (Basic Access ISDN). H.221 creates on each B channel a Frame Structure of 80 bytes, i.e. 640 bits repeating itself 100 times per second. Each bit position in an octet can be considered as an 8 kbit/s sub-channel. The 8th bit in each octet represents the 8th sub-channel, called the Service Channel. Within the Service Channel bits 1-8 are used by the Frame Alignment Signal (FAS) and bits 9-16 are used by the Bit Alignment Signal (BAS). Audio is always carried by the first B channel, e.g. by the first 2 subchannels, and Video and Data by the other subchannels (less the bitrate allocated to FAS and BAS). The solution depicted in Figure 1 bears the mark of the transmission part of the telecom industry that had never been much friendly to packet communication. That is why MPEG in the late 1990’s had an opportunity to bring some fresh air in this space. Starting from a blank sheet of paper (at that time MPEG still used paper 😊) MPEG designed a flexible packet-based multiplexer to convey in a single stream compressed audio and video, and clock information in such a way as to enable audio‑video synchronisation (Figure 2). The MPEG Systems revolution took time to take effect. Indeed the European EU 95 project used MPEG-1 Audio layer 2, but designed a frame-based multiplexer for the Digital Audio Broadcasting service. In the early 1990’s MPEG started working on another blank sheet of paper. MPEG had the experience of MPEG-1 Systems design but the requirements were significantly different. In MPEG-1, audio and video (possibly many of them in the same stream) had a common time base, but the main users of MPEG-2 wanted a system that could deliver a plurality of TV programs, possibly coming from different sources (i.e. with different time bases) and with possibly a lot of metadata related to the programs, not to mention some key business enabler like conditional access information. Moreover, unlike MPEG-1 where it was safe to assume that the bits issuing from a Compact Disc would travel without errors to a demultiplexer, in MPEG-2 it was mandatory to assume that the transmission channel was anything but error-free. 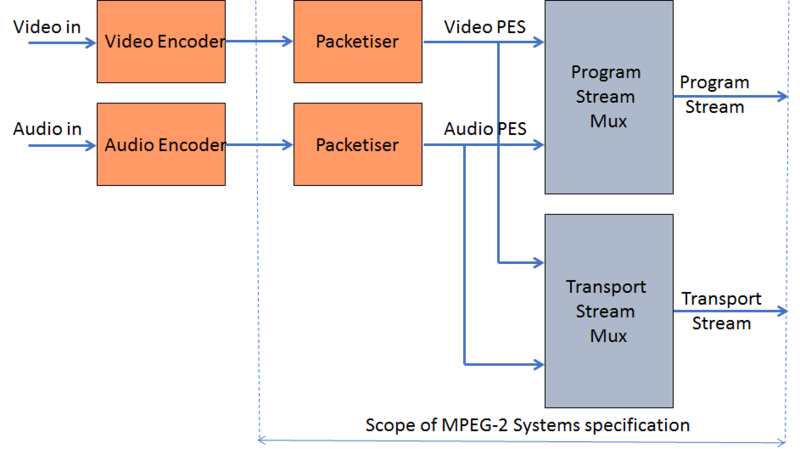 MPEG-2 Transport Stream (TS) provides efficient mechanisms to multiplex multiple audio-visual data streams into one delivery stream. Audio-visual data streams are packetised into small fixed-size packets and interleaved to form a single stream. Information about the multiplexing structure is interleaved with the data packets so that the receiving entity can efficiently identify a specific stream. Sequence numbers help identify missing packets at the receiving end, and timing information is assigned after multiplexing with the assumption that the multiplexed stream will be delivered and played in sequential order. MPEG-2 Systems is actually two specifications in one (Figure 3). The Transport Stream (TS) is a fixed-length packet-based transmission system designed to work for digital television distribution on error-prone physical channels, while the Program Stream (PS) is a packet-based multiplexer with many points in common with MPEG-1 Systems. `While TS and PS share significant information, moving from one to the other may not be immediate. MPEG-4 gave MPEG the opportunity to experience an epochal transition in data delivery. When MPEG-2 Systems was designed Asynchronous Transfer Mode (ATM) was high on the agenda of the telecom industry and was considered as the vehicle to transport MPEG-2 TS streams on telecommunication networks. Indeed, the Digital Audio-Visual Council (DAVIC) designed its specifications on that assumption. At that time, however, IP was still unknown to the telecom (at least to the transmission part, broadcast and consumer electronics worlds. The MPEG-4 Systems work was a completely different story than MPEG-2 Systems. An MPEG4 Mux (M4Mux) was developed along the lines of MPEG-1 and MPEG-2 Systems, but MPEG had to face an unknown world where many transports were surging as possible candidates. MPEG was obviously unable to make choices (today, 25 years later, the choice is clear) and developed the notion of Delivery Multimedia Integration Framework (DMIF), where all communications and data transfers between the data source and the terminal were abstracted through a logical API called the DAI (DMIF Application Interface), independent of the transport type (broadcast, network, storage). MPEG-4 Systems, however, was about more than interfacing with transport and multiplexing. The MPEG-4 model was a 3D space populated with dynamic audio, video and 3D Graphics objects. Binary Format for Scenes (BIFS) was the technology designed to provide the needed functionality. 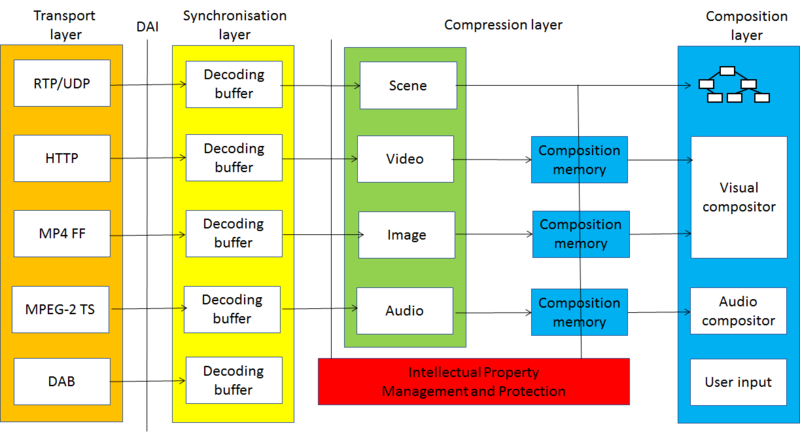 Figure 4 shows the 4 MPEG-4 layers: Transport, Synchonisation, Compression and Composition. For almost 10 years – until 1997 – MPEG was a group who made intense use of IT tools (in the form of computer programs that simulated encoding and decoding operation of the standards it was developing) but was not an “IT group”. The proof? Until that time it had not developed a single file format. Today MPEG can claim to have another such attribute (IT group) along with the many others it has. In those years MP3 files were already being created and exchanged by the millions, but the files did not provide any structure. The MP4 File Format, officially called ISO Base Media File Format (ISO BMFF), filled that gap as it can be used for editing, HTTP streaming and broadcasting. Let’s have a high level look to understand the sea that separates MP3 files from the MP4 FF. MP4 FF contains tracks for each media type (audio, video etc. ), with additional information: a four-character the media type ‘name’ with all parameters needed by the media type decoder. “Track selection data” helps a decoder identify what aspect of a track can be used and to determine which alternatives are available. Save for the first two features, all others were added in the years following 2001 when MP4 FF was approved. The last two are still under development. With MPEG-7, MPEG made the first big departure from media compression and turned its attention to media description including ways to compress that information. 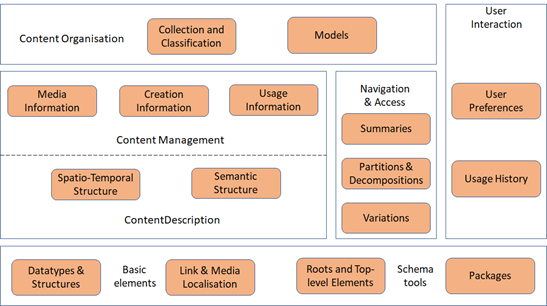 In addition to descriptors for visual audio and multimedia information, MPEG-7 includes a Systems layer used by an application, say, navigation of a multimedia information repository, to access coded information coming from a delivery layer in the form of coded descriptors (in XML or in BiM, MPEG’s XML compression technology). 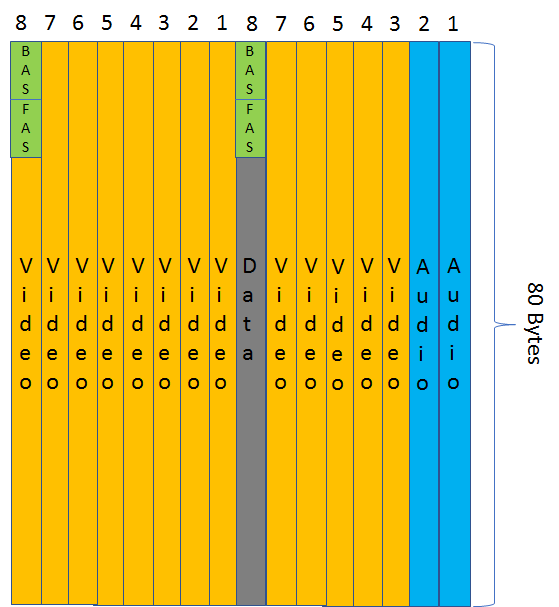 The figure illustrates the operation of MPEG-7 Systems decoder. Initialisation when DecoderInit initialises the decoder by conveying description format information (textual or binary), a list of URIs that identifies schemas, parameters to configure the Fragment Update decoder, and an initial description. The list of URIs is passed to a schema resolver that associates the URIs with schemas to be passed to Fragment Update Decoder. 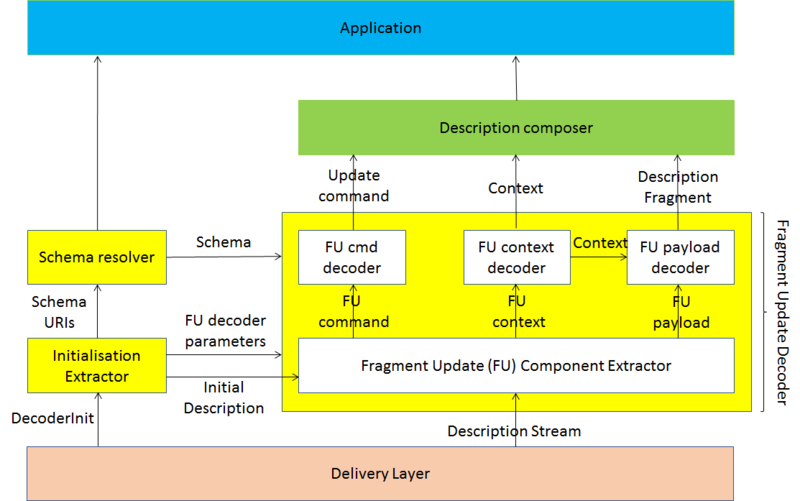 Fragment Update Payload conveying the coded description fragment to be added toor replaced in the description. 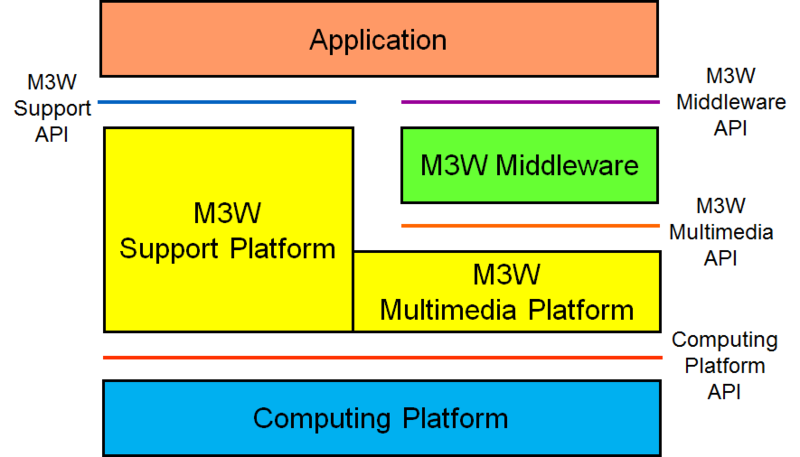 MPEG Multimedia Middleware (M3W), also called MPEG-E, is an 8-part standard defining the protocol stack of consumer-oriented multimedia devices, as depicted in Figure 7. Computing platform: whose API are outside of M3W scope. Multimedia service platform technologies (MPEG-M) specifies two main components of a multimedia device, called peer in MPEG-M.
As shown in Figure 8, the first component is API: High-Level for applications and Low Level for network, energy and security. The Middleware is composed of two types of engine. Technology Engines are used to call functionalities defined by MPEG standards such as creating or interpreting a licence attached to a content item. Protocol Engines are used to communicate with other peer, e.g. in case a peer does not have a particular Technology Engine that another peer has. For instance, a peer can use a Protocol Engine to call a licence server to get a licence to attach to a multimedia content item. The MPEG-M middleware has the ability to create chains of Technology Engines (Orchestration) or Protocol Engines (Aggregation). MPEG Media Transport (MMT) is part 1 of High efficiency coding and media delivery in heterogeneous environments (MPEG-H). It is the solution for the new world of broadcasting where delivery of content can take place over different channels each with different characteristics, e.g. one-way (traditional broadcasting) and two-way (the ever more pervasive broadband network). MMT assumes that the Internet Protocol is common to all channels. Figure 11 focuses on the MMT Payload, i.e. on the content structure. Delivery Information, describing the network characteristics. Dynamic adaptive streaming over HTTP (DASH) is another MPEG Systems standard that was motivated by the popularity of HTTP streaming and the existence of different protocols used in different streaming platforms, e.g. different manifest and segment formats. By developing the DASH standard for HTTP streaming of multimedia content, MPEG has enabled a standard-based client to stream content from any standard-based server, thereby enabling interoperability between servers and clients of different make. 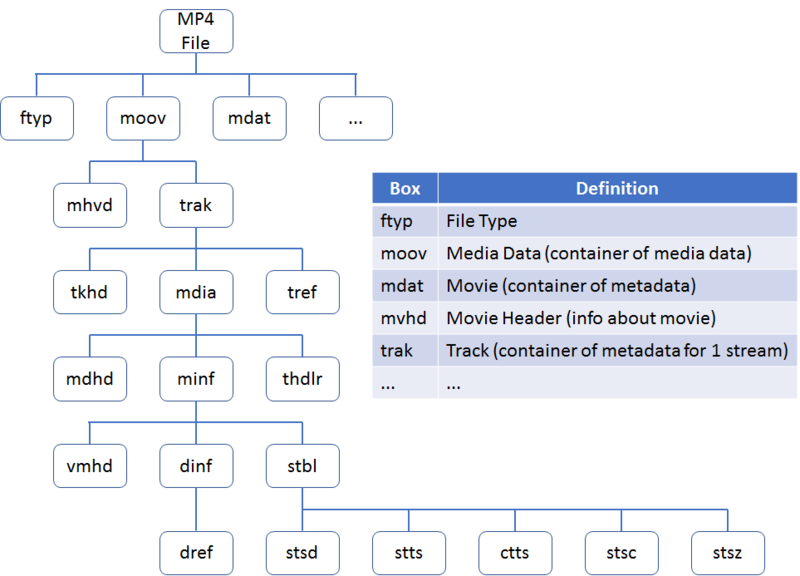 As depicted in Figure 12, the multimedia content is stored on an HTTP server in two components: 1) Media Presentation Description (MPD) which describes a manifest of the available content, its various alternatives, their URL addresses and other characteristics, and 2) Segments which contain the actual multimedia bitstreams in form of chunks, in single or multiple files. Decides how to adapt to the available bandwidth depending on its measurements by fetching segments of different alternatives (with lower or higher bitrate) to maintain an adequate buffer. DASH only defines the MPD and the segment formats. MPD delivery and media encoding formats containing the segments as well as client behavior for fetching, adaptation heuristics and content playing are outside of MPEG-DASH’s scope. The reader should not think that this is an exhaustive presentation of MPEG’s Systems work. I hope the description will reveal the amount of work that MPEG has invested in Systems aspects, sometimes per se, and sometimes to provide adequate support to users of its media coding standards. This article also describes some of the most successful MPEG standards. At the top certainly towers MPEG-2 Systems of which 9 editions have been produced to keep up with continuous user demands for new functionalities. Without mentioning the fact that MPEG-2 Systems has received an Emmy Award 😉. If I exchange words with taxi drivers in a city somewhere in the world, one of the questions I am usually asked is: “where are you from?”. As I do not like straight answers, I usually ask back “where do you think I am from?” It usually takes time before the driver gets the information he asked for. Then the next question is: “what is your job?”. Again, instead of giving a straight answer, I ask the question: “do you know MPEG?” Well, believe it or not, 9 out of 10 times the answer is “yes”, often supplemented by an explanation decently connected with what MPEG is. Wow! Do we need a more convincing proof that MPEG has conquered the minds of the people of the world? The interesting side of the story, though, is that, even if the name MPEG is known by billions of people, it is not a trademark. Officially, the word MPEG does not even exist. When talking to ISO you should say “ISO/IEC JTC 1/SC 29/WG 11” (next time, ask your taxi driver if they know this letter soup). The last insult is that the mpeg.org domain is owned by somebody who just keeps it without using it. Should all this be of concern? Maybe for some, but not for me. What I have just talked about is just one aspect of what MPEG has always been. Do you think that MPEG was the result of high-level committees made of luminaries advising governments to take action on the future of media? You are going to be disappointed. MPEG was born haphazardly (read here, if you want to know how). Its strength is that it has been driven by the idea that the epochal transition from analogue to digital should not become another PAL-SECAM-NTSC or VHS-Betamax trap. There is no sign that its original driving force is abating, unless… Read until the end if you want to know more. MPEG was the first standards group that brought digital media to the masses. In the 2nd half of the 1990’s the MPEG-1 and MPEG-2 standards were converted to products and services as the list below will show (not that the use of MPEG-1 and MPEG-2 is confined to the 1990’s). Digital Audio Broadcasting: in 1995, just 3 years after MPEG-1 was approved, DAB services began to appear in Europe with DAB receivers becoming available some time later. Portable music: in 1997, 5 years after MPEG-1 was approved, Saehan Information Systems launched MPMan, probably the first portable digital audio player for the mass market that used MP3. This was followed by a long list of competing players until the mobile handset largely took over that function. Video CD: in the second half of the 1990’s VCD spread especially in South East Asia until the MPEG-2 based DVD, with its superior quality, slowly replaced it. It uses all 3 parts of MPEG-1 (layer 2 for audio). Digital Satellite broadcasting: in June 1994 DirecTV launched its satellite TV broadcasting service for the US market, even before MPEG released the MPEG-2 standard in November of that year! It used MPEG-2 and its lead was followed by many other regions who gradually converted their analogue broadcast services to digital. Digital Cable distribution: in 1992 John Malone launched the “500-channel” vision for future cable services and MPEG gave the cable industry the means to make that vision real. In 1996 the USA Federal Communications Commission adopted the ATSC A/53 standard. It took some time, however, before wide coverage of the country, and of other countries following the ATSC standards, was achieved. In 1998 the UK introduced Digital Terrestrial Television (DTT). In 2003 Japan started DTT services using MPEG-2 AAC for audio in addition to MPEG-2 Video and TS. DTT is not deployed in all countries yet, and there are regularly news of a country switching to digital, the MPEG way of course. Digital Versatile Disc (DVD): toward the end of the 1990’s the first DVD players were put to market. They used MPEG-2 Program Stream (part 1 of MPEG-2) and MPEG-2 Video, and a host of audio formats, some from MPEG. In the 1990s the Consumer Electronics industry provided devices to the broadcasting and telecom industries. and devices for package media. The shift to digital services called for the IT industry to join as providers of big servers for broadcasting and interactive services (even though in the 1990’s the latter did not take off). The separate case of portable audio players provided by startups did not fit the established categories. MPEG-4 played the fundamental role of bringing the IT industry under the folds of MPEG as a primary player in the media space. Video for all: MPEG-4 Advanced Video Coding (AVC) became a truly universal standard adopted in all areas and countries. Broadcasting, internet distribution, package media (Blu-ray) and more. Media files: the MP4 File Format is the general structure for time-based media files, that has become another ubiquitous standard at the basis of modern digital media. Advanced text and graphics: the Open Font Format (OFF), based on the OpenType specification, revised and extended by MPEG, is universally used. Media production and archiving metadata: are satisfied by the MPEG-7 AudioVisual Description Profile (AVDP), developed with participation of the broadcasting industry. Format for encrypted, adaptable multimedia presentation: is provided by the Common Media Application Format (CMAF), a format optimised for large scale delivery of protected media with a variety of adaptive streaming, broadcast, download, and storage delivery methods including DASH and MMT. Interoperable image format: the Multi-Image Application Format (MIAF) enables precise interoperability points for creating, reading, parsing, and decoding images embedded in HEIF. Generic binary format for XML: is provided by Binary format for XML (BiM), a standard used by products and services designed to work according to ARIB and DVB specifications. Common encryption for files and streams: is provided by Common Encryption (CENC) defined in two MPEG-B standards – Part 7 for MP4 Files and Parts 9 for MPEG-2 Transport Stream. CENC is widely used for the delivery of video to billions of devices capable to access internet-delivered stored files, MPEG-2 Transport Syteam and live adaptive streaming. 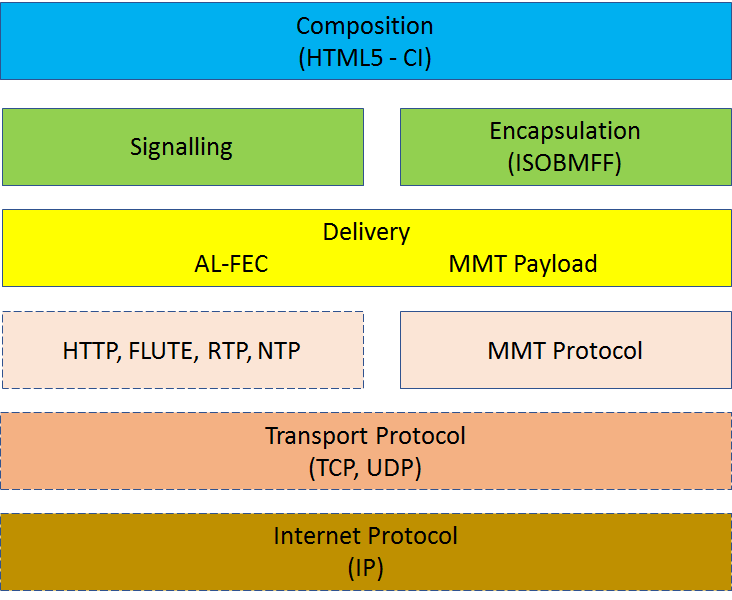 IP-based television: MPEG Media Transport (MMT) is the “transport layer” of IP-based television. MMT assumes that delivery is achieved by an IP network with in-network intelligent caches close to the receiving entities. Caches adaptively packetise and push the content to receiving entities. 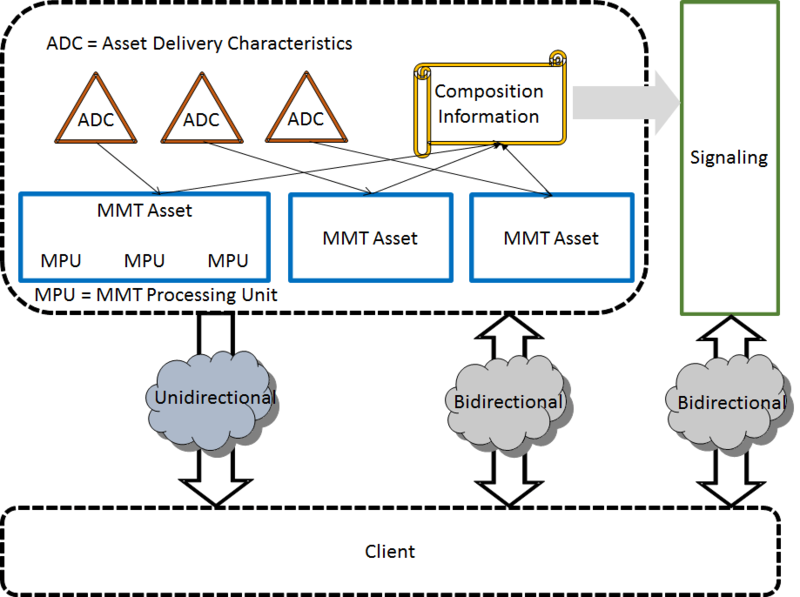 MMT has been adopted by the ATSC 3.0 standard and is currently being deployed in countries adopting ATSC standards and also used in low-delay streaming applications. Not the ultimate audio experience, but close: MPEG-H 3D Audio is a comprehensive audio compression standard capable of providing very satisfactory immersive audio experiences in broadcast and interactive applications, It is part of the ATSC 3.0 standard. Comprehensive image file format: High Efficiency Image File Format (HEIF) is a file format for individual HEVC-encoded images and sequences of images. It is a container capable of storing HEVC intra-images and constrained HEVC inter-images, together with other data such as audio in a way that is compatible with the MP4 File Format. HEIF is widely used and supported by major OSs and image editing software. Streaming on the unreliable internet: Dynamic Adapting Streaming on HTTP (DASH) is the widely used standard that enables a media client connected to a media server via the internet to obtain instant-by-instant the version, among those available on the server, that best suites the momentary network conditions. What is MPEG doing now? In the preceding chapter I singled out only MPEG standards that have been (and often still continue to be) extremely successful. At the risk of making the wrong bet 😊. let me introduce some of the most high profile standards under development, subdivided in the three categories Media Coding, Systems and Tools, and Beyond Media. But you have better become acquainted with all ongoing activities. In MPEG sometimes the last become the first. Versatile Video Coding (VVC): is the flagship video compression activity that will deliver another round of improved video compression. It is expected to be the platform on which MPEG will build new technologies for immersive visual experiences (see below). Immersive visual technologies: investigations on technologies applicable to visual information captured by different camera arrangements are under way, as described in The MPEG drive to immersive visual experiences. Point Cloud Compression (PCC): refers to two standards capable of compressing 3D point clouds captured with multiple cameras and depth sensors. The algorithms in both standards are lossy, scalable, progressive and support random access to point cloud subsets. See The MPEG drive to immersive visual experiences for more details. Immersive audio: MPEG-H 3D Audio supports a 3 Degrees of Freedom or 3DoF (yaw, pitch, roll) experience at the movie “sweet spot”. More complete user experiences, however, are needed, i.e. 6 DoF (adding x, y, z). These can be achieved with additional metadata and rendering technology. Omnidirectional media format: Omnidirectional Media Application Format (OMAF) v1 is a format supporting the interoperable exchange of omnidirectional (VR 360) content for a user who can only Yaw, Pitch and Roll their head. OMAF v2 will support some head translation movements. See The MPEG drive to immersive visual experiences for more details. Storage of PCC data in MP4 FF: MPEG is developing systems support to enable storage and transport of compressed point clouds with DASH, MMT etc. Scene Description Interface: MPEG is investigating the interface to the scene description (not the technology) to enable rich immersive experiences. Service interface for immersive media: Network-based Media Processing will enable a user to obtain potentially very sophisticated processing functionality from a network service via standard API. Standards for biotechnology applications: MPEG is finalising all 5 parts of the MPEG-G standard and establishing new liaisons to investigate new opportunities. Coping with neural networks everywhere: shortly (25 March 2019) MPEG will receive responses to its Call for Proposals for Neural Network Compression as described in Moving intelligence around. What will MPEG do in the future? At the risk of being considered boastful, I would think that MPEG should have deserved attention from some of the business schools that study socio-economic phenomena. Why? Because many have talked about media convergence, but they have forgotten that MPEG, with its standards, has actually triggered that convergence. MPEG people know the ecosystem at work in MPEG and I for one see how it is unique. This has not happened. Let’s say that it is better to be neglected than to receive unwanted attention. I would also think that a body that started from a Subcommittee on character sets and has become the reference standards group for the media industry, i.e. devices, content, services and applications, worth hundreds of billion USD with potent influences on a nearby industry such as telecommunication, should have suggested standards organisations to study the work method and possibly apply it to other domains. This has not happened. Let’s say, again, that its is better to be neglected than to receive unwanted attention. So can we expect MPEG to continue its mission, and apply its technologies and know how to continue delivering compression standards for immersive experiences and new compression standards for other domains? Maybe this time MPEG will attract attention. So, don’t count on it. In How does MPEG actually work? I described the MPEG process: once an idea is launched, context and objectives of the idea are identified; use cases submitted and analysed; requirements derived from use cases; and technologies proposed, validated for their effectiveness for eventual incorporation into the standard. Some people complain that MPEG standards contain too many technologies supporting “non-mainstream” use cases. Such complaints are understandable but misplaced. MPEG standards are designed to satisfy the needs of different industries and what is a must for some, may well not be needed by others. To avoid burdening a significant group of users of the standard with technologies considered irrelevant, from the very beginning MPEG adopted the “profile approach”. This allows to retain a technology for those who need it without encumbering those who do not. It is true that there are a few examples where some technologies in an otherwise successful standard get unused. Was adding such technologies a mistake? In hindsight yes, but at the time a standard is developed the future is anybody’s guess and MPEG does not want find out later that one of its standards misses a functionality that was deemed to be necessary in some use cases and that technology could support at the time the standard was developed. For sure there is a cost in adding the technology to the standard – and this is borne by the companies proposing the technology – but there is no burden to those who do not need it because they can use another profile. Examples of such “non-mainstream” technologies are provided by those supporting stereo vision. Since as early as MPEG-2 Video, multiview and/or 3D profile(s) have been present in most MPEG video coding standards. Therefore, this article will review the attempts made by MPEG at developing new and better technologies to support what are called today immersive experiences. MPEG-1 did not have big ambitions (but the outcome was not modest at all ;-). MPEG-2 was ambitious because it included scalability – a technology that reached maturity only some 10 years later – and multiview. As depicted in Figure 1, multiview was possible because if you have two close cameras pointing to the same scene, you can exploit intraframe, interframe and interview redundancy. Both MPEG-2 scalability and multiview saw little take up. Both MPEG-4 Visual and AVC had multiview profiles. 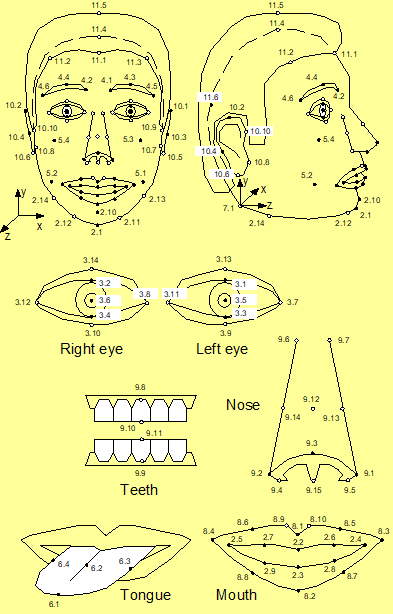 AVC had 3D profiles next to multiview profiles. Multiview Video Coding (MVC) of AVC was adopted by the Blu-ray Disc Association, but the rest of the industry took another turn as depicted in Figure 2. 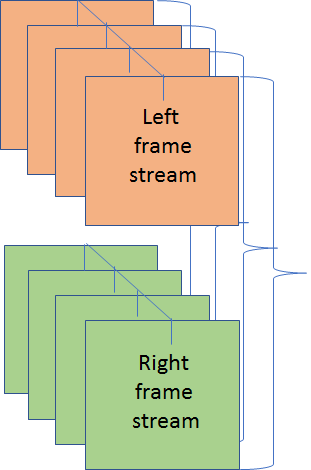 If the left and right frames of two video streams are packed in one frame, regular AVC compression can be applied to the packed frame. At the decoder, the frames are de-packed after decompression and the two video streams are obtained. This is a practical but less that optimal solution. Unless the frame size of the codec is not doubled, you either compromise the horizontal or the vertical resolution depending on the frame-packing method used. Because of this a host of other more sophisticates, but eventually non successful, frame packing methods have been introduced into the AVC and HEVC standards. The relevant information is carried by Supplemental Enhancement Information (SEI) messages, because the specific frame packing method used is not normative. The HEVC standard, too, supports 3D vision with tools that efficiently compress depth maps, and exploit the redundancy between video pictures and associated depth maps. Unfortunately use of HEVC for 3D video has also been limited. The MPEG-I project – ISO/IEC 23090 Coded representation of immersive media – was launched at a time when the word “immersive” was prominent in many news headings. 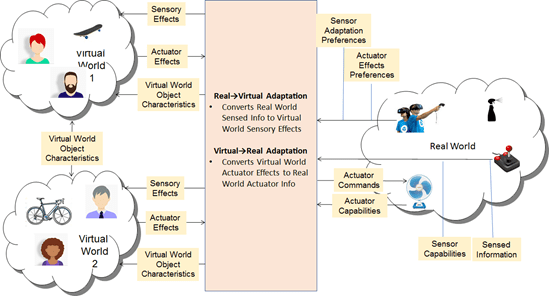 Figure 3 gives three examples of immersivity where technology challenges increase moving from left to right. In 3 Degrees of Freedom (3DoF) the user is static but the head that can Yaw, Pitch and Roll. In 3DoF+ the user has the added capability of some head movements in the three directions. In 6 Degrees of Freedom the user can freely walk in a 3D space. 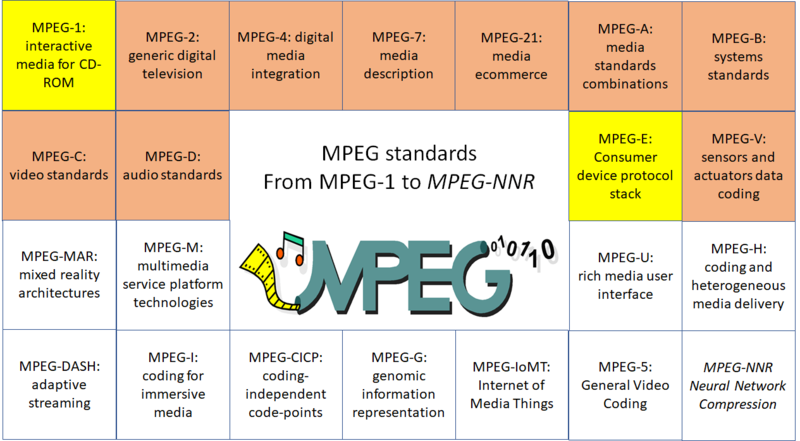 Currently there are several activities in MPEG that aim at developing standards that support some form of immersivity. While they had different starting points, they are likely to converge to one or, at least, a cluster of points (hopefully not to a cloud😊). Delivery of OMAF content with MPEG-DASH and MMT. MPEG has released OMAF in 2018 that is now published as an ISO standard (ISO/IEC 23090-2). If the current version of OMAF is applied to a 3DoF+ scenario, the user may feel parallax errors that are more annoying the larger the movement of the head. To address this problem, at the January 2019 meeting MPEG has issued a call for proposals requesting appropriate metadata (see the red blocks in Figure 4) to help the Post-processor to present the best image based on the viewer’s position if available, or to synthesise a missing one, if not available. The 3DoF+ standard will be added to OMAF which will be published as 2nd edition. Both standards are planned to be completed in October 2020. Versatile Video Coding (VVC) is the latest in the line of MPEG video compression standards supporting 3D vision. Currently VVC does not specifically include full-immersion technologies, as it only supports omnidirectional video as in HEVC. However, VVC could not only replace HEVC in the Figure 4, but also be the target of other immersive technologies as will be explained later. 3D point clouds can be captured with multiple cameras and depth sensors with points that can number a few thousands up to a few billions, and with attributes such as colour, material properties etc. MPEG is developing two different standards whose choice depends on whether the points are dense (Video-based PCC) or less so (Graphic-based PCC). The algorithms in both standards are lossy, scalable, progressive and support random access to subsets of the point cloud. See here for an example of a Point Cloud test sequence being used by MPEG for developing the V-PCC standard. MPEG plans to release Video-based Point Cloud Compression as FDIS in October 2019 and Graphic-based PCC Point Cloud Compression as FDIS in April 2020. Next to PCC compression MPEG is working on Carriage of Point Cloud Data with the goal to specify how PCC data can be stored in ISOBMFF and transported with DASH, MMT etc. MPEG is carrying out explorations on technologies that enable 6 degrees of freedom (6DoF). The reference diagram for that work is what looks like a minor extension of the 3DoF+ reference model (see Figure 5), but may have huge technology implications. To enable a viewer to freely move in a space and enjoy a 3D virtual experience that matches the one in the real world, we still need some metadata as in 3DoF+ but also additional video compression technologies that could be plugged into the VVC standard. Plenoptic cameras whose sensors capture the intensity of light from a number of directions that the light rays travel to reach the sensor. Technologically speaking, #4 is an area that has not been shy in promises and is delivering on some of them. However, economic sustainability for companies engaged in developing products for the entertainment market has been a challenge. The relative coding performance of Multiview coding and Lenslet coding, both for Lenslet Video Data (#4). However, MPEG is not engaged in checking the relative coding performance of #2 data and #4 data because there are no #2 and #4 test data for the same scene. In good(?) old times MPEG could develop video coding standards – from MPEG-1 to VVC – by relying on established input video formats. This somehow continues to be true for Point Clouds as well. On the other hand, Light Field is a different matter because the capture technologies are still evolving and the actual format in which the data are provided has an impact on the actual processing that MPEG applies to reduce the bitrate. MPEG has bravely picked up the gauntlet and its machine is grinding data to provide answers that will eventually lead to one or more visual compression standards to enable rewarding immersive user experiences. MPEG is planning a “Workshop on standard coding technologies for immersive visual experiences” in Gothenburg (Sweden) on 10 July 2019. The workshop, open to the industry, will be an opportunity for MPEG to meet its client industries, report on its results and discuss industries’ needs for immersive visual experiences standards. In Is there a logic in MPEG standards? I described the first steps in MPEG life that look so “easy” now: MPEG-1 (1988) for interactive video and digital audio broadcasting; MPEG-2 (1991) for digital television; MPEG-4 (1993) for digital audio and video on fixed and mobile internet; MPEG-7 (1997) for audio-video-multimedia metadata; MPEG-21 (2000) for trading of digital content. Just these 5 standards, whose starting dates cover 12 years i.e. 40% of MPEG’s life time, include 86 specifications, i.e. 43% of the entire production of MPEG standards. MPEG-21 was the first to depart from the one and trine nature of MPEG standards: Systems, Video and Audio, and that departure has continued until MPEG-H. Being one and trine is a good qualification for success, but MPEG standards do not have to be one and trine to be successful, as this paper will show. The official title of MPEG-A is Multimedia Application Formats. The idea behind MPEG-A is kind of obvious: we have standards for media elements (audio, video 3D graphics, metadata etc. ), but what should one do to be interoperable when combining different media elements? 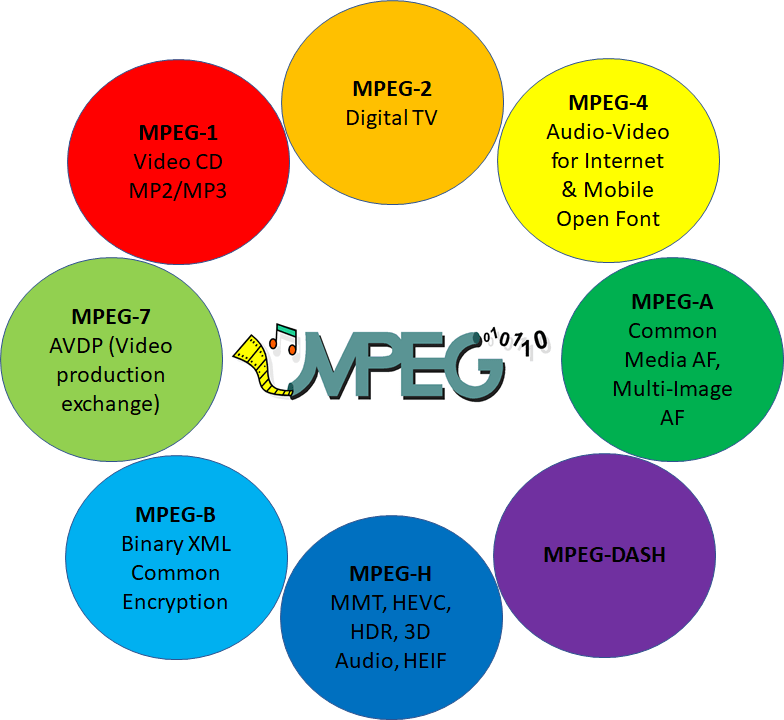 Therefore MPEG-A is a suite of specifications that define application formats integrating existing MPEG technologies to provide interoperability for specific applications. Unlike the preceding standards that provided generic technologies for specific contexts, the link that unites MPEG-A specifications is the task of combing MPEG and, when necessary, other technologies for specific needs. Part 22 – Multi-Image Application Format enables precise interoperability points for creating, reading, parsing, and decoding images embedded in a High Efficiency Image File (HEIF). The official title of MPEG-B is MPEG systems technologies. After developing MPEG-1, -2, -4 and -7, MPEG realised that there were specific systems technologies that did not fit naturally into any part 1 of those standards. Thus, after using the letter A in MPEG-A, MPEG decided to use the letter B for this new family of specifications. Part 15 – Carriage of Web Resource in MP4 FF specifies how to use MP4 File Format tools to enrich audio/video content, as well as audio-only content, with synchronised, animated, interactive web data, including overlays. The official title of MPEG-C is MPEG video technologies. As for systems, MPEG realised that there were specific video technologies supplemental to video compression that did not fit naturally into any part 2 of the MPEG-1, -2, -4 and -7 standards. Part 4 – Media tool library contains modules called Functional Units expressed in the RVC-CAL language. These can be used to assemble some of the main MPEG Video coding standards, including HEVC and 3D Graphics compression standards, including 3DMC. The official title of MPEG-C is MPEG audio technologies. Unlike MPEG-C, MPEG-D parts 1, 2 and 3 actually specify audio codecs that are not generic, as MPEG-1, MPEG-2 and MPEG-4 but intended to address specific application targets. This standard is the result of an entirely new direction of MPEG standardisation. Starting from the need to define API that applications can call to access key MPEG technologies MPEG developed a Call for Proposal to which several responses were received MPEG reviewed the responses and developed the ISO/IEC standard called Multimedia Middleware. The development of the MPEG-V standard Media context and control started in 2006 from the consideration that MPEG media – audio, video, 3D graphics etc. – offer virtual experiences that may be a digital replica of a real world, a digital instance of a virtual world or a combination of natural and virtual worlds. At that time, however, MPEG could not offer users any means to interact with those worlds. The standards from MPEG-A to MPEG-V include 59 specifications that extend over the entire 30 years of MPEG activity. These standards account for 29% of the entire production of MPEG standards. In this period of time MPEG standards have addessed more of the same technologies – systems (MPEG-B), video (MPEG-C) and audio (MPEG-D) – and have covered other features beyond those initially addressed: application formats (MPEG-A), media application life cycle (MPEG-E), and interaction of the real world with virtual worlds, and between virtual world (MPEG-V). Media technologies evolve and so do their applications. Sometimes applications succeed and sometimes fail. So do MPEG standards. Artificial intelligence has reached the attention of mass media and technologies supporting it – Neural Networks (NN) – are being deployed in several contexts affecting end users, e.g. in their smart phones. If a NN is used locally, it is possible to use existing digital representation of NNs (e.g., NNEF, ONNX). However, these format miss vital features for distributing intelligence, such as compression, scalability and incremental updates. To appreciate the need for compression let’s consider the case of adjusting the automatic mode of a camera based on recognition of scene/object obtained by using a properly trained NN. As this area is intensely investigated, very soon there will be a new better trained version of the NN or a new NN with additional features. However, as the process to create the necessary “intelligence” usually takes time and labor (skilled and unskilled), in most cases the new created intelligence must be moved from the center to where the user handset is. With today’s NNs reaching a size of several hundred Mbytes and growing, a scenario where millions of users clog the network because they are all downloading the latest NN with great new features looks likely. This article describes some elements of the MPEG work plan to develop one or more standards that enable compression of neural networks. Those wishing to know more please read Use cases and Requirements, and Call for Proposals. Transmit an output signal to other nodes. Nodes are typically aggregated into layers, each performing different functions. Typically the “first layers” are rather specific of the signals (audio, video, various forms of text information etc.). Nodes can send signals to subsequent layers but, depending on the type of network, also to the preceding layers. Training is the process of “teaching” a network to do a particular job, e.g. recognising a particular object or a particular word. This is done by presenting to the NN data from which it can “learn”. Inference is the process of presenting to a trained network new data to get a response about what the new data is. When is NN compression useful? Compression is useful whenever there is a need to distribute NNs to remotely located devices. Depending on the specific use case, compression should be accompanied by other features. In the following two major use cases will be analysed. In 2009 MPEG developed the Surveillance Application Format. This is a standard that specifies the package (file format) containing audio, video and metadata to be transmitted to a surveillance center. Today, however, it is possible to introduce to ask the surveillance network to do more more intelligent things by distributing intelligence even down to the level of visual and audio sensors. For this more advanced scenarios MPEG is developing a suite of specifications under the title of Internet of Media Things (IoMT) where Media Things (MThing) are the media “versions” of IoT’s Things. The IoMT standard (ISO/IEC 23093) will reach FDIS level in March 2019. IoMT is neutral as to the type of semantic extraction or, more generally, to nature of intelligence actually present in the cameras. However, as NNs networks are demonstrating better and better results for visual pattern recognition, such as object detection, object tracking and action recognition, cameras can be equipped with NNs capable to process the information captured to achieve a level of understanding and transmit that understanding through interface 2. Therefore, one can imagine that re-trained or brand new NNs can be regularly uploaded to a server that distributes NNs to surveillance cameras. Distribution need not be uniform since different neural networks may be needed at different areas, depending on the tasks that need to be specifically carried out at given areas. NN compression is a vitally important technology to make the described scenarios real because automatic surveillance system may use many cameras (e.g. thousands and even million units) and because, as the technology to create NNs matures, the time between NN updates will progressively become shorter. There are many cases where compression is useful to efficiently distribute heavy NN-based apps to a large number of devices, in particular mobile. Here 3 case are considered. Visual apps. Updating a NN-based camera app in one’s mobile handset will soon become common place. Ditto for the many conceivable application where the smart phone understand some of the objects in the world around. Both will happen at an accelerated frequency. Machine translation (speech-to-text, translation, text-to-speech). NN-based translation apps already exist and their number, efficiency, and language support can only increase. Adaptive streaming. As AI-based methods can improve the QoE, the coded representation of NNs can initially be made available to clients prior to streaming while updates can be made during streaming to enable better adaptation decisions, i.e. better QoE. The MPEG Call for Proposals identifies a number of requirements that a compressed neural network should satisfy. Even though not all applications need the support of all requirements, the NN comnpression algorithm must eventually be able to support all the identified requirements. The currently published Call for Proposals is not requesting technologies for all requirements listed above (which are themselves a subset of all identified requirements). It is expected, however, that the responses to the CfP will provide enough technology to produce a base layer standard that will help the industry move its first steps in this exciting field that will shape the way intelligence is added to things near to all of us.